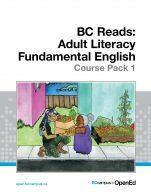 This course pack is designed to meet the learning outcomes for Adult Literacy Fundamental English Level 1 (roughly equivalent to beginner to grade 1.5 in the K-12 system). 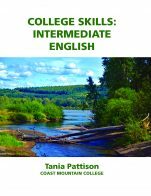 Every of the nine chapters includes a level-appropriate, high-interest reading of approximately 100 words. 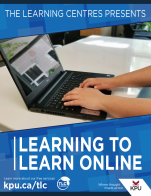 The readings are freely available in a separate reader with convenient links to the readings in each chapter of this course pack. The online version of this course pack also contains audio recordings of each story in the reader. 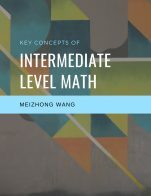 These recordings, combined with vocabulary and word pattern exercises, prepare the Level 1 student to read each paragraph-long text with greater independence. Font size and line spacing can be adjusted in the online view, and have been enhanced for the print and PDF versions for easier reading. This course pack has been reviewed by subject experts from colleges and universities. "Val's Garden" by Carlee Ashton Diabo is used under a CC BY 4.0 International Licence (https://creativecommons.org/licenses/by/4.0/). 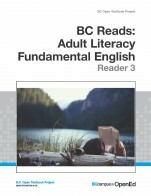 BC Reads: Adult Literacy Fundamental English - Course Pack 1 by Shantel Ivits, Vancouver Community College is licensed under a Creative Commons Attribution 4.0 International License, except where otherwise noted.